Here comes the Christmas, you may get an iPod or an iPhone. And you want to know where to download free songs and videos for your iPod or iPhone. Limewire is the most popular place to get what you need. And this step by step guide will teach you how to download and put Limewire free songs and videos on iPod iPhone. Step1. You need to download and install Limewire at first. (Here is the limewire download link). We take the Basic version as example in this guide. Then run the Limewire. Type in a keyword (such as Michael Jackson) in the search bar, and then wait a few seconds, Limewire will return a lot of michael jackson related download link results. Step2. Click the download link, then Limewire will start the downloading process. (Tips: higher number will lead faster download speed). 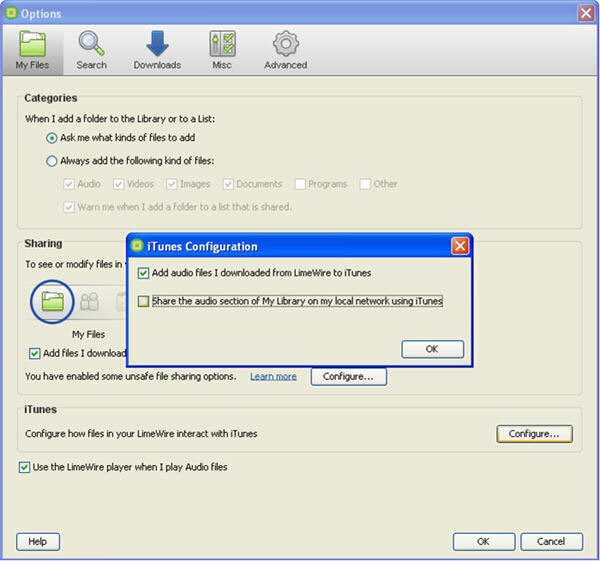 Once the download process is finished, Limewire will automatically add the downloaded songs into your iTunes library (if you have installed iTunes), then you can plug in your iPod or iPhone to computer and sync it with iTunes, done. Step1. Download video is the same as audio. Type in the keyword (such as twilight), Go to “video” categories, find the file you want, click the link to start to download it. Step2. After the download process was finished, located the limewire video file on your computer, limewire default save folder is “C:\Documents and Settings\Administrator\My Documents\LimeWire\Saved”. iPod and iPhone both support only MP4 video, if your download file is already mp4 video, you can drag it into iTunes library and sync it to your iPod or iPhone directly. But most Limewire video files are MPEG or AVI. You can use this Limewire Video Converter to convert them to iPod compatible MP4 video. I tried many video converters, and this one works best with Limewire video. It’s compatible with Windows 7 and 64 bits system. You can learn more information about it by referring to here. Drag the video into the limewire video converter, set the profile to “iPod Video MPEG-4(*.mp4)“, click start to begin the conversion. It will take a few minutes to finish the conversion. Then drags the converted MP4 video into your iTunes library and sync the Limewire video to your iPod or iPhone, this video converter build-in an iPod transfer. You can use it to upload Limewire songs or videos to iPod if you don’t want to use iTunes. That’s all. Enjoy my guide on putting Limewire songs and videos on iPod, Merry Christmas.